From Sumvitg (east of Disentis, Switzerland) one can travel to Caplutta Sogn Benedetg on foot or by car. Before you reach the chapel, however, you hit upon the ruins of the old chapel. 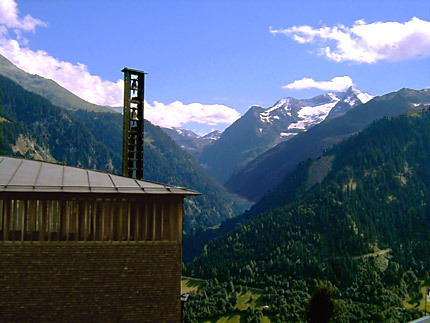 It is a tribute to the past, to the Monastery of Disentis to which this chapel belonged. 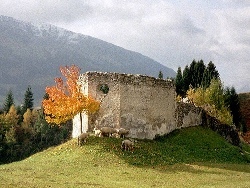 The old chapel was destroyed by an avalanche at the beginning of the ‘80s. 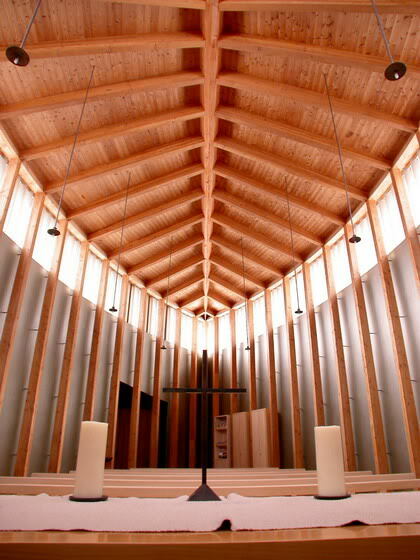 The Monastery of Disentis commissioned Peter Zumthor to design a new chapel. The chapel (consecrated to St. Benedict) is now positioned on a rather steep slope just above the houses of the little village of Sogn Benedetg and is beautifully taken up in the scenery and living environment. Peter Zumthor (1943) is an internationally renowned architect, winner of the prestigious Pritzker price 2009 (the “Nobel prize” for architecture). 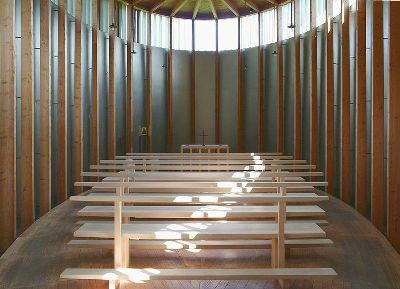 At the end of the ‘80s he designed this remarkable chapel together with his wife. It was finished in 1988. Initially Zumthor was a furniture maker. In the ‘60’s he studied architecture, among others at the Pratt Institute in New York. Since 1996 he is a professor at the Accademia di Architettura in Mendrisio, Italy. His craftsmanship, love of wood, his vision that architecture can have its own life, his play with light, materials and forms give the observer ample space to take Zumthor’s work in and enjoy its incredible beauty. When one stands eye to eye with the chapel, one sees the cross on the slightly curved roof and also the separate tower. The tower actually is a wooden ladder with two bells at the top. One cannot escape thinking about the image and story of Jacob’s dream as it can be read in Genesis 28: 10 – 22. 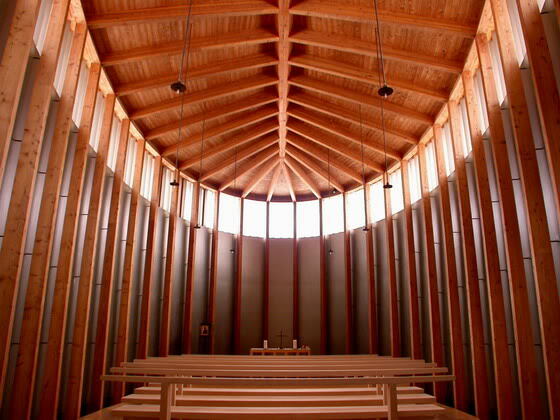 One notices the curved walls of the chapel, dressed with wooden “scales” that have a lively radiance. In years to come the wooden “scales” will change their colour due to the weather and the sunlight. The south side of the chapel will no doubt become black and the north side silver grey, as also happens to the houses and barns in Switzerland. When walking around the chapel, one notices that the leaf- or drop-like form of the structure at the entrance has the resemblance of the prow of a ship. Upon descending a few steps of concrete, one stands in front of the ribbed wooden door, through which one enters the spout-like little hall of the chapel. Here one experiences warmth and protection, as if the church were the lap of God. Immediately the beautiful pattern of lines of the roof bearers and buttresses stands out, lines that continue in the ceiling and give the visitor the image of a ship that is upside down. The stylish, light-coloured lime benches participate in the rhythmic play of lines and forms. Nothing seems to have been left to chance. The floor appears to float on the concrete and has a fish-bone motif that extends from the middle of church, which corresponds again with the ceiling. Boat and fish evoke the many stories of Jesus: Jesus calling the disciples to follow him, Jesus on the lake, the miraculous catch of fish, etc. The boat form also refers to the ship as a symbol for the church, the ship of salvation. Behind the liturgical centre the silver-coloured wall attracts attention. In combination with the high windows the wall reflects the incoming light in a glorious way. You also can’t miss the icon of Mary. Mary, who grips you in her gaze. The baptismal font is placed in the back of the church. It is anchored in the concrete floor, as an image of the sacrament, God’s covenant with man. The chapel in Sogn Benedetg is a work of art, but most of all an impressive place to meet God. That is also exactly what Peter Zumthor wants to accomplish with his work, namely that one searches for the experiences that a building wants to conjure up. Carla Bulsing-Barth taught history and has a broad interest in art and culture. On her travels she likes to visit the churches she encounters on her walks. 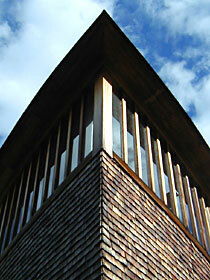 Once a month we will discuss a striking contemporary or 20th-century church. Each time we want to deal with a church from a different country. We are open to receiving tips about remarkable churches. After a year we will ask you which of the twelve churches you appreciated most.